Please Note: Institute acceptance is required before you can make a tuition payment. Institute-trained team reports impressive outcomes: Psychiatric Review: Gordon,C. et al. (July 15, 2016). 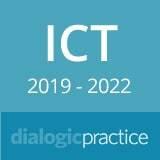 The 2019-2022 International Certification Training Program in Dialogic Practice meets the international standards for full training in Open Dialogue. It is an opportunity to study with the premier, international faculty. It includes in alphabetical order: Jorma Ahonen, MSc, Nazlim Hagmann, MD, Mia Kurtti, MSc, Mary Olson, PhD, Russell Razzaque, MD, Peter Rober, PhD, and Jaakko Seikkula, PhD. This three-year program is delivered in four intensives per year in New York City and taught by the world’s leading developers and trainers. The small-group seminar format provides personal attention and nurtures the professional development and individual creativity of each participant. This tuition covers 4 blocks and monthly online supervision. $1200 deposit is due upon acceptance. Participants make a one year commitment. Apply early by sending your CV/resume. An interview is required either in person or by SKYPE. Provide an in-depth understanding of the key elements of Dialogic Practice and Open Dialogue. Foster the clinical skills of therapeutic responsiveness and reflection. Give a broad overview of the evolution of Dialogic Practice in the family therapy tradition that, founded on Gregory Bateson’s work, made language and communication central to the therapeutic process. Integrate social justice issues that are particularly relevant to North American society, including survivorship, gender, race, ethnicity, class, sexual orientation and diversity. Cultivate the creativity of the participants as they adapt these new learnings to their own personal styles and settings. Examine the ethics of Dialogic Practice and Open Dialogue. The curriculum will include a combination of lectures, experiential exercises, a discussion of readings, role-plays, videotapes, live consultations, family-of-origin work, and supervision. A certificate of completion will be provided after Level 1 & Level 2. Advanced standing may be awarded to participants who have already completed Levels 1 and/or 2 and wish to become certified as practitioners or trainers. Certification requires the submission of videotapes and writing various papers. Institute-trained team reports impressive outcomes in peer-reviewed study led by Harvard psychiatrist: Gordon,C. et al. (July 15, 2016).